Holy Family School nurtures connection, community, and confidence for all students – from our youngest learners in pre-school through our teens in the eighth grade. Our teachers are dedicated to educating the whole child and reinforcing the values you instill at home. With the challenges facing young people today, a rigorous academic program coupled with a spirit of compassion, humility, and charity provides an amazing and unique start for our children. Like all Archdiocesan elementary schools, Holy Family’s curriculum is rooted in scholastic tradition while also relevant for today’s world. Learn more HERE. Did you know that last year, Holy Family was recognized as a U.S. Department of Education Blue Ribbon School of Excellence? Our school has been commended for using pioneering innovative educational practices including professional learning communities, project-based learning, social and emotional learning, and positive behavior systems. Through the CARES program, Holy Family also offers before-school and after-school care until 6 p.m. with time to complete homework, play outside, and enjoy a healthy snack. It is not too early to think about the start of your child’s formal education. We invite you to visit Holy Family and meet our new principal, Mr. Tom Dever, our faculty, and our students. 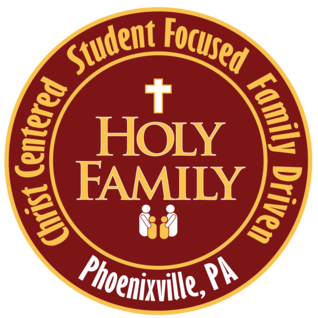 To schedule a tour, learn about financial aid, or ask any questions, please contact Cathy Cane at advancement@myholyfamilyschool.org or call our office at (610) 933-7562. Come and see for yourself the impact of Holy Family School – Christ Centered, Student Focused, Family Driven.